On September 19, 1865, Thomas May Peirce opened the doors of what would originally be named Union Business College. His vision was clear; deliver practical, career-focused education to non-traditional learners in Philadelphia, and develop a workforce that would meet the evolving needs of Philadelphia employers. Peirce President & CEO Jim Mergiotti cuts the cake at the College's 151st Founder's Day celebration. Thomas May Peirce founded Peirce College in 1865 when he was just 27 years old. allows students to choose week-to-week if they prefer to attend class on campus or online, the College is continuing Thomas May Peirce’s vision in the 21st century. 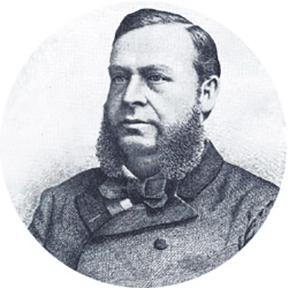 To learn more about how Peirce has been educating adults in Philadelphia for 151 years, click here. Are you an ITT Tech student trying to figure out your next move? We can help! With the recent shutdown of ITT Technical Institute, many ITT students may find themselves struggling with what to do next. Peirce has opened its doors to ITT students to provide them with a seamless transition to keep their education on track. 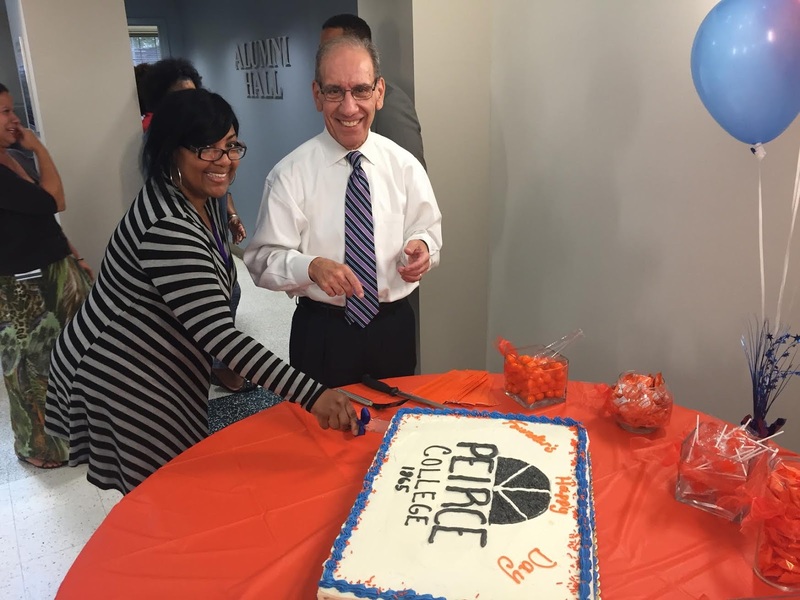 Peirce College has more than 150 years of experience serving Philadelphia’s adult learners. Being a non-profit institution, our students’ tuition is re-invested into providing a quality educational experience. Peirce College is accredited by the Middle States Commission on Higher Education* and offers practical associate, bachelor’s and master’s degrees developed in alignment with employer needs. ITT students will enjoy the unique flexibility of Peirce Fit™ across our entire curriculum (business, healthcare, legal studies, and information technology programs). Our competency-based bachelor’s degree in Information Technology could also be a fit for ITT students with work experience in the IT field. The Peirce enrollment and student financial services team is briefed and ready to support ITT Tech students on credit transfer; credit-by-examination test options; ITT loan forgiveness; and any other questions they may have to make a seamless transition to complete their degree. If you are a former ITT student or know someone affected by the ITT Tech closure, encourage them to register for our upcoming information session, click here or contact Peirce today. Our next session starts on September 26th so it’s not too late to enroll for fall! We look forward to seeing you at Peirce College! To learn more about Peirce College, and how we can help you earn the degree you need for the career you deserve, click here. Know someone who could benefit from this information? Share this blog post with them! *The Middle States Commission on Higher Education, 3624 Market Street, Philadelphia, PA, 19104, phone 267-284-5000. This week on the blog, we’re getting to know some of the faces featured in Peirce College’s current advertising campaign. Today, meet Carl! Tell us how you first heard about Peirce College. I had first noticed Peirce College from their advertisements around the city on buses, bus stops, etc. I knew very little about the school aside from the fact that it was the only ABA approved school in the area for Paralegal Studies bachelor’s degrees. I decided to do some research on Peirce College and had an on-campus interview. What made you decide to return to school to get your certificate in Paralegal Studies? After college, I worked for two years but was laid off. I felt like I was in a rut, so I started to explore certificate options that would pair nicely with my Bachelor's Degree in American History and make me a little more marketable to employers. Peirce has a long history of career focused degrees, and with it also being an ABA approved school, it seemed like the best fit. What was your student experience like at Peirce? Class sizes were intimate enough to be personal, and the professors were all passionate. Glenn Barnes and Carol Sherman were professors who I had multiple classes with early on, and they left remarkable impressions on me. Their classrooms were a great combination of humor and learning. How did Peirce’s curriculum prepare you for a real world career as a paralegal? It gave me a great foundation for my career as a paralegal. In the legal field, all cases, venues, and locations are different and have their own nuances. You can’t really learn the specifics of every situation, so you really need to understand the legal system, know how to find information, and be able to analyze that information. Peirce College gave me the ability to do that. How has the certificate you earned at Peirce made a difference in your career? I currently work as a paralegal at a law firm in Philadelphia. Peirce helped prepare me with a strong understanding of all legal systems, as well as the research that would be required of me. My time at Peirce definitely helped prepare me for what I would eventually be doing. What advice would you give to adults who need to earn their degree and are thinking about going back to school? It doesn’t have to be difficult; it can be as easy as you make it. If you apply yourself fully, you can complete the required classes as quickly as possible and get up-and-running with your new career. Don't wait! Be enthusiastic. Want to learn. quality of life has definitely improved. I see myself continuing to be a paralegal for quite some time. Thanks for sharing your thoughts with us, Carl! Keep an eye out for Carl as you ride SEPTA regional rail lines or PATCO. 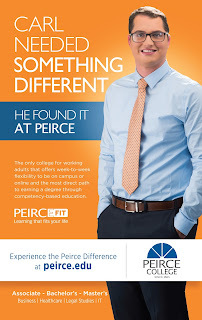 To find out how you can experience the Peirce Difference, click here.